Hy! I have some problem with my laptop in the last week,is really slow…and i don t know if is because of the Endless or because of the laptop. I have an ASUS x540S,Dual Core,4 GB RAM and 1 TB HDD. How can i solve this? Thx! Your best bet is to see what is using your computer’s resources. The built in Activity Monitor which you can search for on the desktop, provides information about how your computer’s resources are being used. The most useful pane in the application is the process/thread pane, which will tell you what items are using your processor as well as what percentage of your processors power is being used. It you sort the process/thread view by clicking on the cpu usage column it will list the items using cpu power. This should give you an excellent idea of what processes/threads are eating up your power. Often an errant thread will consume an inordinate amount of cpu power. The thread name will often provide a clue as to what application is responsible for the use and you can quit that application. Or just double clicking the thread name will bring up the option to kill/end the process. This will often give you performance back. Sometimes for whatever reason once restarted will go right back to sucking down all your performance. In such a case it is often a problem with the applications preferences or with its cache, both of which can be deleted to give the application a fresh start. In rarer cases the application many have installed incorrectly in which case you can remove it from the software center and then reinstall it again. Do you have a lot of browser tabs/windows open? Does the problem appear to happen when loading certain websites? Does the problem go away if you close Firefox? Do you have the same problem when using other browsers? Hy Roddy! The problem appear always,doesn’t matter which websites I’m loading. If i close the Firefox,the problem is there, also on Chromium was worse,it takes more than 1 min to load,for example,the App Center without any browser open.And usually I had max. 3 or 4 tabs open. @LeandroStanger That is an interesting observation, and I had not considered it. While the log does show that @Ana-Maria_Ivan is on 3.1.6, and while the computer has a Realtek Ethernet driver, the WiFi driver is not from Realtek, so I’m not sure if it would have been impacted. And, at least on the computer I tested, the symptom was that the WiFi card was not even shown as available. Still, it might be worth upgrading to 3.1.7 (Settings > Details > Check for updates now) even if just to rule that out, especially if the problem started just this week. It is interesting that the App Center is so slow, too. When the App Center is first opened, it does try to reach the server, so all signs so far are pointing to a networking issue. 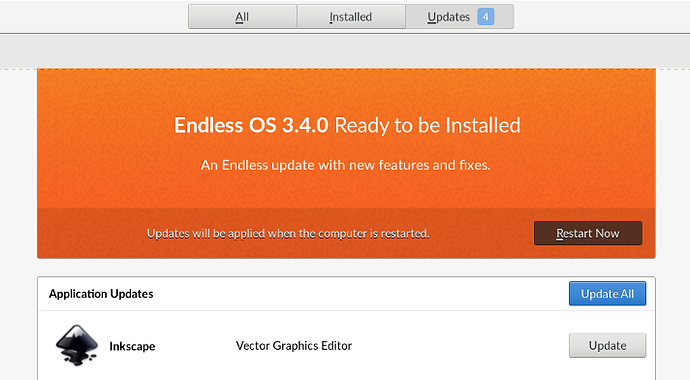 I see that you started with a 2.x version of Endless and updated to 3.x. So I presume everything was working fine and just recently started to be problematic. And, assuming there are no obvious problems with slowness to boot the computer, we can probably rule out processor / disk drive issues. Please try to upgrade to 3.1.7, and let me know if that helps. If not, I’ll see if we have access to an ASUS X540S that we can test to try to determine if there is a software bug. Also, if you have the ability to connect an Ethernet wire, it would be helpful to know if the problem is only while using WiFi. @roddy The Realtek problem in 3.1.6 is an “all or nothing” thing - if the kernel tries to load the Realtek module, there is a clash of symbol names with the new driver we added - the module loader crashes - so you get no wifi at all and the kernel is in a slightly broken state (explaining the shutdown issues and probably other miscellaneous issues). No sign of that happening here - as you say it’s an ath9k driver for a Qualcomm card which should be one of the good ones. There’s nothing obvious I can see skimming the log, but there are some errors in the log like “unable to resolve name” which suggests some kind of intermittent networking issue but it’s not obvious whether it’s caused by an issue on the laptop (eg with the wireless) or just on the network more generally. Testing with an ethernet is a great idea to try and reduce some of the uncertainty. Maybe also try a simple network check like www.speedtest.net on ethernet and wireless and see if it differs significantly. Here is the test. Sorry I was busy with the license for the university. It seems is working fine, now when I want to watch some online movies is framed. Hi - i have the same issue and attach the diagnostic file, thanks for any help ! Why do you think reinstalling Endless OS would help? When you say you feel it’s running slow, are there particular actions that you’d expect to be faster?